When you write about spring in Maine it’s almost obligatory to begin by saying, “Spring comes slowly. . . .” But that isn’t entirely true. Spring, in fact, comes to Maine in frustrating fits and starts. I recall balmy weekends in late February back when I was in high school in Bethel and my pals and I would go off in our Fair Isle sweaters and Bermuda shorts to spend the day skiing in the Sunday River sunshine. And I also recall a spring evening years later, beating my way down Route 17 in a blizzard—not a snow flurry, but a blinding, all-out, day-long blizzard—trying to get from Augusta back to South Thomaston where I had a fearful ten-year-old waiting at home alone. That was on April 15th and it was the first time I heard the phrase “poor man’s fertilizer,” meaning those late spring snows that carpet the plowed fields and drive nutrients deep down into the soil where the plants’ roots will fix. So when does spring begin in this motley state where on any one day the temperature can vary by 30 degrees, where it can be blowing snow in the mountains and sailing weather on the coast? We have had to develop other ways than the weather of knowing when spring is upon us. Among the reliable harbingers of spring are robins, though nowadays they stay year-round, grubbing on greening lawns, red-winged blackbirds darting over farm ponds, and what we call phoebes, but are actually black-capped chickadees singing for spring with their two-stroke call: phoebe, phoe-be, feeee-bee. And then, one magical evening toward the end of March or early in April, we hear in the near distance the first tentative peep of spring peepers, the tiny frogs that inhabit vernal pools and river banks and peep-peep-peep frantically, males calling to females with desperate urgency, we can then relax at last because we know now that, come what may—rising water, late frosts, sudden snowstorms—it is spring. But spring is not all sound and fury, birdsong and flooding streams. It’s also about what we eat and why. Take dandelion greens, for instance. Back in the old days (I’m thinking almost a century ago when my parents were young), folks were sick to death of winter diets by March: salt fish, salt pork, dried beans, sprouting onions and potatoes, squashes and apples that were showing their wear. What could be more appetizing than a bowl of fresh greens, newly harvested, dressed with a splash of vinegar and bacon sautéed in its own fat? My mother said we needed greens in springtime for iron to bulk up our thinning blood. Is that true? Close enough for me not to want to discount it. She gathered dandelion greens with a sharp little paring knife, cleaned them of soil, steamed them for a very long time, and served them with a splash of vinegar to cut the bitterness. Look for glossy green fronds, tightly furled, with a pearly freshness to them. They should be cleaned of the papery covering, which can simply be rubbed off, and steamed for 10 to 15 minutes. As soon as they’re tender, they’re ready to serve with melted butter, a spritz of lemon, a sprinkle of Maine sea salt, and several twists of the pepper mill. I’ve also been known to sauté fiddleheads, steaming them for just 5 minutes, then sizzling them in a mixture of butter and olive oil, again with a spritz of lemon on top at the very end. 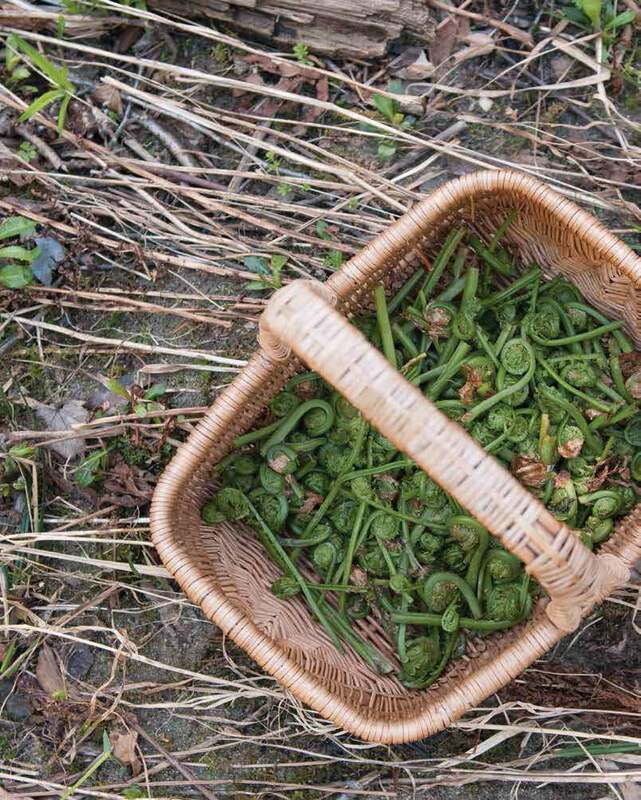 No matter which way you do it, fiddleheads should be cooked until very tender. I know there is wild asparagus out there in the woods but frankly I’ve never been able to find it. In any case, nothing, to my mind, beats asparagus fresh from the garden, the green spears snapped off just moments before cooking. My father was a champion asparagus grower and he especially loved it for breakfast—steamed and served on buttered toast with more melted butter poured over the top. He liked the cultured butter he got when he visited his relatives down in Jonesboro, with its slight taste of the barn, and I’m happy to say that, after years of subsisting on Land O’Lakes, that kind of butter is being produced once more in Maine, from venerable producers like Kate’s in Ogunquit to Casco Bay Butter in Portland and Pleasant Acres in Livermore Falls. Asparagus season is usually seen as a reason to consume the green spears until your pee smells grassy, morning, noon, and night. If you get tired of plain boiled asparagus, there are loads of other things to do with it, from soup to salad (cold asparagus with a vinaigrette sauce); asparagus is delicious grilled over charcoal and almost as good baked in a gratin dish with a cheesy sauce and buttered breadcrumbs on top. And if you want to go fancy for dinner, you would not go wrong with risotto. The one thing you must keep in mind is the right kind of rice to use: Arborio rice is widely available; Carnaroli or Vialone Nano, if you can find them, are even better. 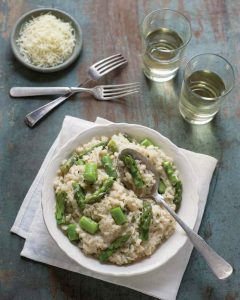 But don’t use ordinary long grain rice, which lacks the starchiness a good risotto needs. But spring is not all sound and fury, birdsong and flooding streams. It’s also about what we eat and why. Risotto recipes usually call for grated Parmigiano-Reggiano, but it’s fun to use an aged Maine-made cheese instead. Try Hahn’s End’s Ragged Island, made from cow’s milk, for instance, or York Hill’s Capriano goat cheese, aged anywhere from 5 months to a year. 1 Heat the stock to a bare simmer and keep it simmering gently while you make the risotto. 2 In a heavy kettle or saucepan large enough to hold all of the rice when cooked, melt the butter in the oil and add the sliced onions. Sauté them gently over medium-low heat until they are thoroughly softened but not browned, about 15 minutes. Add the rice and stir well with a wooden spoon, until coated with oil. Cook the rice for about 5 minutes or until it appears translucent. Raise the heat slightly and add the wine. Cook, stirring gently—just a couple of strokes—until the wine has evaporated or been absorbed by the rice. stirring as you add. There should always be liquid visible in the pan but it shouldn’t be soupy. Do not add all the liquid at once; this will produce boiled rice instead of risotto. After about 10 minutes, stir in the reserved tips of the asparagus, and continue adding the liquid. 5 The rice will be done when it’s soft but with a bit of bite in the center—what Italians call al dente. Each grain should be well coated with the asparagus sauce, which should be dense and almost syrupy. The risotto should be thick enough to eat with a fork and not soupy. (You may not need to use all the stock.) Total cooking time varies from 20 to 30 minutes, depending on the degree of doneness that you’re looking for. 6 While the rice is cooking, combine the ricotta and chives or parsley (or both) and beat with a small wire whisk or a fork until thoroughly incorporated. 7 When the rice is done, remove the pan from the heat and immediately stir in the ricotta-parsley mixture along with 1/4 cup of grated cheese. Add a few grinds of pepper, cover the pan, and let it sit for 5 minutes to settle the flavors. Taste before serving and add more salt if you wish. Serve immediately, passing the rest of the grated cheese at the table. * Want to be sure you’re using Maine asparagus and not something grown in Mexico? Look on Mainelocavore.org for a growing number of farms that can supply vegetables, especially asparagus. Or check with your farmers market: Often even if farmers don’t grow asparagus themselves, they will know someone who does.